Serial entrepreneur Andre Angel started TangoTab following a volunteer experience that brought him face-to-face with today’s working hungry. Armed with his business experience and a new-found passion, Andre founded TangoTab to apply business principles to solving a social problem. And solving problems is, in Andre’s words, what entrepreneurs do. For you, TangoTab is free, easy, and makes a difference in our community. Find the links below to download the app and be sure to use the code FRISCO when you register to help feed the hungry in Frisco. 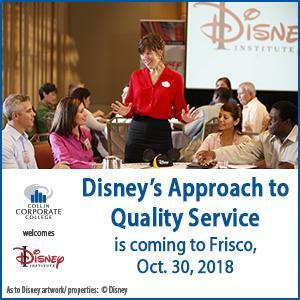 Register for “Disney’s Approach to Quality Service” at Collin College in Frisco.